Cecilia Gimenez And Her Good Intentions. . . .
You’ve heard it said that “the road to hell is paved with good intentions.” I’m not sure that there’s a connect between that familiar saying and the good intentions shown by 80-year-old Cecilia Gimenez, but I’m guessing that there are those zealots who would accuse the woman of behavior worthy of eternity in Hades. I’m not one of them. Instead, Gimenez and her good intentions have turned out to be a somewhat humorous story. . . at least for some. Gimenez lives in Borja, Spain, where she attends the Santuario del Misericordia Roman Catholic Church. For over a century, a fresco of Jesus Christ crowned with thorns has graced the church’s wall. Over time, moisture on the walls had caused the fresco to chip and flake. This is where I imagine Gimenez. . . most likely a woman who takes great pride in her faith and her church. . . decided to step up and do something about the decaying fresco. . . all from the kindness of her own heart. So, working from a decade-old photo of the fresco, she decided to begin the painstaking (or normally painstaking!) 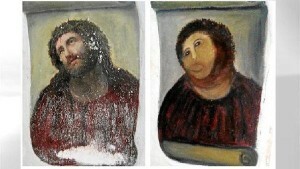 process of art restoration. . . . which she has since completed. When people saw the “restored” fresco, it was assumed (quite legitimately, I might add!) that an act of vandalism had occurred. That’s when a surprised Gimenez stepped up with surprise to tell people that she had restored the painting. So here it is. . . before restoration and after restoration. What do you think? I had two thoughts when I saw this story this morning. First, God bless Cecilia Gimenez. I really think she thought she was doing the right thing. Hopefully, however, her career as an art restorationist has come to an end. Second, I thought that this is just the kind of thing that pastors and youth workers are going to get some amazing mileage out of. There’s humor. There’s metaphor. There are endless illustrations to be had. So. . . go at it folks. I’m interested in hearing what you all think! For now, I’m just going to continue staring at the “after” version. I know that the fresco includes the top and bottom of a scroll. But I keep looking at the bottom and wondering if Jesus is a) wearing a wrist watch, or b) holding a freshly basked pumpkin roll. ← Sitting By The Grave. . . . Since most of the Renaissance artwork has represented Jesus as a white European, I imagine that the “restored” painting is really no less accurate than the original version. My hope is that if Ms. Gimenez did her restoration work with a heart of glorifying God, then she isn’t on the receiving end of too much derision from art lovers!